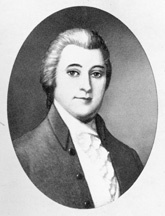 BLOUNT, William, (father of William Grainger Blount and brother of Thomas Blount), a Delegate from North Carolina and a Senator from Tennessee; born near Windsor, Bertie County, N.C., March 26, 1749; pursued preparatory studies in New Bern, N.C.; paymaster of the Continental troops, North Carolina Line, in 1777; member, State house of commons 1780-1784; Member of the Continental Congress in 1782, 1783, 1786, and 1787; delegate to the Federal Constitutional Convention in Philadelphia in 1787 and one of the signers of the Constitution; member, State senate 1788-1790; appointed Governor of the Territory South of the Ohio river by President George Washington in 1790; Superintendent of Indian Affairs 1790-1796; chairman of the convention which framed the first State constitution of Tennessee 1796; upon the admission of Tennessee as a State into the Union was elected to the United States Senate and served from August 2, 1796, until he was found guilty of a high misdemeanor, entirely inconsistent with his public trust and duty as a Senator, because he had been active in a plan to incite the Creek and Cherokee Indians to aid the British in conquering the Spanish territory of West Florida; expelled from the Senate July 8, 1797; impeachment proceedings were instituted but dismissed; during the trial was elected to the State senate of Tennessee and chosen its president; died in Knoxville, Tenn., March 21, 1800; interment in the First Presbyterian Church Cemetery. American National Biography; Dictionary of American Biography; Masterson, William. William Blount. 1954. Reprint. New York: Greenwood Press, 1969; Melton, Buckner F., Jr. The First Impeachment: The Constitutions Framers and the Case of Senator William Blount. Macon, Georgia: Mercer University Press, 1998.